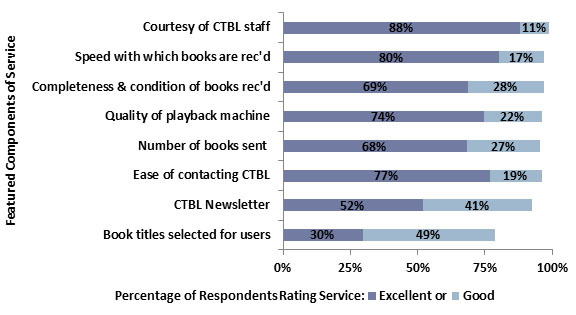 In 2010, the Library Research Service (LRS) administered the fourth patron satisfaction and outcome survey for the Colorado Talking Book Library (CTBL). It is clear from the survey results and the comments left by respondents that the overwhelming majority of patrons are very pleased with CTBL service. 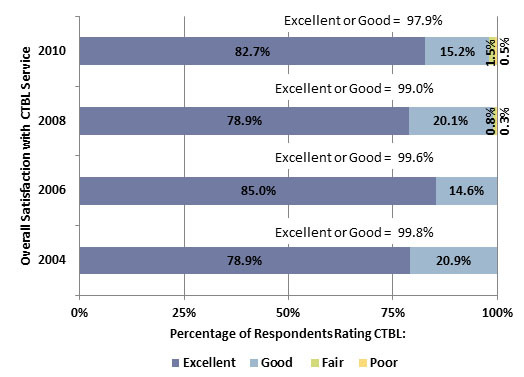 Overall satisfaction is quite high—nearly all respondents (98%) rated CTBL as excellent or good (see Chart 1). The Colorado Talking Book Library (CTBL) provides free library services to around 7,000 patrons who, due to physical, visual, or learning disabilities, are unable to read standard print material. CTBL’s collection consists of 58,000 talking books, 7,000 digital titles, 6,000 titles in Braille, 19,000 titles in large print, and about 300 descriptive videos. CTBL is part of the Colorado State Library, a division of the Colorado Department of Education, and is affiliated with the Library of Congress, National Library Service for the Blind and Physically Handicapped (NLS). In addition to rating their overall satisfaction with CTBL, respondents were asked to rate their satisfaction with selected components of CTBL service. Overall, respondents expressed satisfaction with all of the components of service asked about; no component was rated below 79% excellent or good. Respondents had the highest satisfaction with “courtesy of library staff,” receiving 99% excellent or good and “speed with which we get books to you,” with 97% excellent or good (see Chart 2). 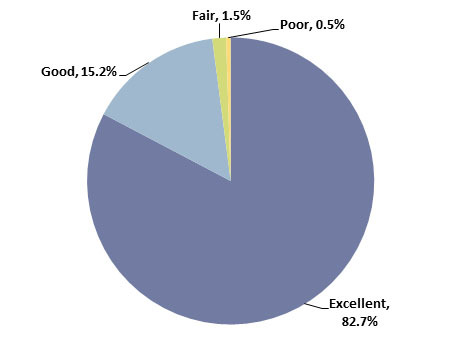 Although still at very high levels, the 2 lowest rated components of service were the “Colorado Talking Book Newsletter,” which 93% of respondents rated excellent or good, and “the book titles we select for you,” at 79% excellent or good. Satisfaction with the newsletter and titles reflect a small drop from previous years. • Books may be ordered via mail, email, phone, fax, or online. • The library loans the playback machines free of charge to its patrons. • Patrons can request specific titles or books can be selected for them based on their reading interests. Two other service components also saw changes in the ratings from 2008—“quality of the playback machine we have loaned to you” and “completeness and condition of the books you receive”—experiencing a dramatic increase in the number of respondents that rated these as excellent. Almost three-quarters of respondents rated the quality of the playback machine as excellent (74%) in 2010 compared to 44 percent in 2008, while the excellent ratings for the completeness of the books increased to 69 percent in 2010 from 57 percent in 2008. Debbi MacLeod, CTBL Director, attributes this change to the rollout of new digital talking book players that started in September 2009. Many of the comments left by respondents referred to the improvement in the digital machines over the older cassette players. By far, reading for pleasure is the most frequently valued outcome of CTBL service, selected by more than 8 out of 10 (85%) survey respondents (see Chart 3). Several comments reflected this, as they frequently mentioned how much of a gift it is to just be able to read with the assistance of CTBL services. More than 1 in 3 patrons (37%) reported that they learned more about a personal interest using CTBL services. Finding information for school was the third-most selected value of CTBL (16%), which is the same as 2008. This may reflect the increase in the number of school aged patrons who received and responded to the survey in the 2008 and 2010 survey. In the 2006 survey, only 7 percent of respondents valued finding information for school. The vast majority of patrons are highly satisfied with CTBL service. Nearly all respondents gave high ratings for their overall satisfaction with CTBL and individual service components. Beyond the high ratings, the comments left by survey respondents give testimony to how important CTBL is to its patrons. Comments show that through CTBL, patrons are able to read for pleasure, stay informed, and feel connected. Summer reading programs have long been a staple offering of public libraries’ youth services departments. These programs incorporate strategies to engage young patrons in books, and to develop and maintain reading skills during school vacation. Recently, adult summer reading programs have also become common. Similar to children’s and teens’ programs, these programs engage patrons in reading and dialogue with other readers, and help to promote literacy skills and lifelong learning opportunities. Following the lead of summer reading programs for youth, adult summer reading programs tend to be organized around a theme, which guides the development of promotional materials, reading lists, and types of activities offered. The Collaborative Summer Library Program, a consortium of states that works together to develop summer reading program materials for use by public libraries around the United States, began providing themed curriculum for adult programs in 2009. In 2010,2 the theme was “Water Your Mind: Read,” which focused on water-related topics (e.g., lawn care, conservation). Adult summer reading programs include patrons older than 18. In 2010, 41 public libraries in Colorado offered these programs. 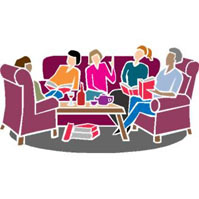 Popular adult summer reading program activities include book discussion groups as well as events that relate to the theme. For example, for the 2010 theme, water-themed movie nights and programs on topics such as local water issues and gardening were typical offerings. Libraries also encourage participation by inviting adult registrants to give book suggestions, submit book reviews online, and post online photos of themselves reading or engaging in activities related to the theme. To reward registrants for reading, prizes are typically offered, ranging from materials with the library’s logo, to gift certificates and merchandise from local businesses, to popular consumer technology products such as iPods and netbooks. Adult summer reading programs benefit both the library and patrons in various ways. In terms of benefits to the library, these programs generate positive publicity; help to promote other library services and programs; increase visits, circulation, and number of registered library cardholders; attract new segments of the population to the library; and strengthen community partnerships. Benefits for patrons include opportunities for learning and literacy development, as well as exposure to new literary genres. These programs also emphasize the importance of reading to patrons, and promote the idea that reading is fun and reduces stress. In addition, for patrons who are parents or caregivers to children, adult summer reading programs provide opportunities to be involved in common activities with their children, and to model good reading behavior for them. 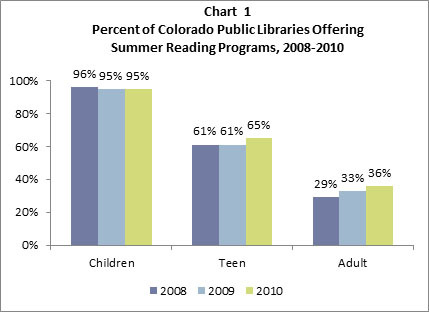 Between 2008 and 2010, almost all public libraries in Colorado offered summer reading programs for children, and close to two-thirds offered these programs for teens (see Chart 1). The number of libraries offering adult summer reading programs rose from 29 percent in 2008 to 36 percent in 2010. From 2008 to 2010, the percent of summer reading registrants who were children dropped from 76 percent to 70 percent (see Table 1). Teen registrants rose slightly from 17 percent to 19 percent, while the percentage of adult registrants increased from 7 percent to 11 percent. It is important to note that the age range definitions for children and teens changed starting in 2009, which impacted the numbers and proportions for both of these groups (see Table 1 for age ranges). 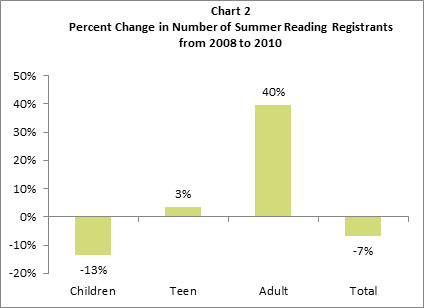 The total number of registrants in summer reading programs decreased by 7 percent from 2008 to 2010 (see Chart 2). This decrease was due to a drop of 13 percent in the number of child registrants. In contrast, the number of teen registrants increased slightly during this time period (3%), while the number of adult registrants increased by 40 percent. The decline in child registrants may be attributed at least in part to the most recent recession (December 2007-June 2009). Shrinking library budgets may have led to several factors that negatively impacted the number of registrants, including closed branch libraries, reduced marketing efforts, and a limited schedule of events. As noted earlier, the change in age range definitions starting in 2009 for children and teens also impacted the numbers of registrants for both age groups. On the other hand, the rise in adult registrants may be due in part to the increased efforts to provide libraries with adult summer reading program resources over the past decade, for example, the Collaborative Summer Library Program’s development of themed curriculum that was mentioned above. Summer reading programs continue to be popular offerings in Colorado public libraries, particularly for children and teens. Although adult programs are the least prevalent, they have been on the rise from 2008 to 2010, in terms of both the number of libraries offering these programs as well as the number of registrants. As information about adult programs spreads and planning resources become more widely available, it seems likely these programs will continue to grow. An analysis of the statistics reported over the next few years will help to determine whether adult summer reading programs will join their youth counterparts in becoming staple offerings in Colorado public libraries. In September 2010, the New York Times published an article about the privatization of public libraries.4 This article described the trend in some communities to turn over the management of public libraries to a private organization. In response to this article, library staff around the United States engaged in spirited online discussions about whether libraries should be privatized. 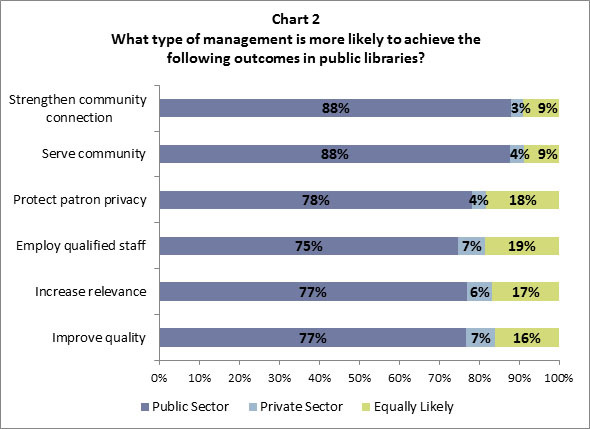 Results from this study indicate that the library community, as represented by the survey respondents, has serious concerns about the impact of privatization on public libraries. For further discussion of these results, see the article “Who’s the boss? 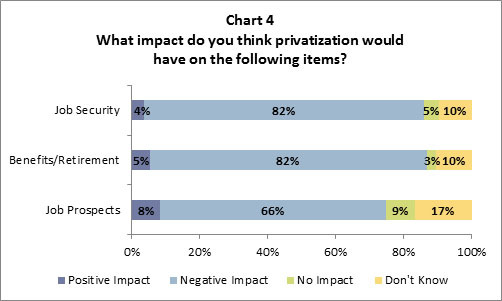 Does privatization have a place in public libraries?”5 in American Libraries. Public libraries provide a wide range of programs for their communities, engaging, educating, and entertaining library patrons with everything from computer training to language classes to gaming. This important service has grown in recent years, with public libraries in the U.S. increasing the number of programs they offer by 33 percent between 2004 and 2008,6 according to national data. Expanding program offerings has paid off, as program attendance has also substantially increased. 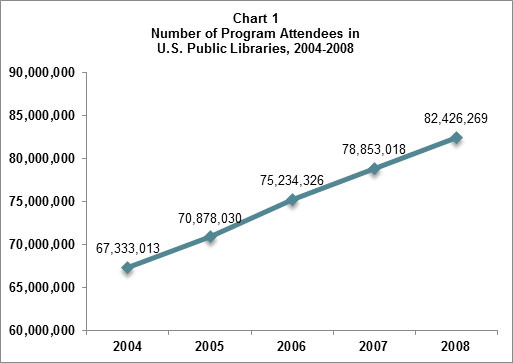 During the same 4-year period, annual program attendance in U.S. public libraries increased by 22 percent (see Chart 1). It is certainly good news that program attendance has increased, but some may wonder how much other library services are being used. The answer is that other library services are being used regularly. In fact, as the number of program attendees increased, circulation and reference questions also increased based on 2008 data (see Chart 2). 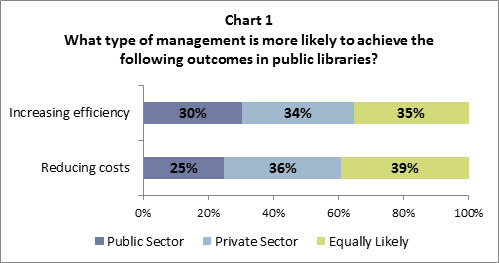 For example, libraries in the top quartile (i.e., in the top 25% of public libraries in terms of program attendance per 5,000 served) circulate more than 3 times as many items as libraries with fewer than 695 program attendees (bottom quartile, or the bottom 25% in terms of program attendees per 5,000 served). This does not mean that one service causes the others to increase, but there is a positive relationship between these services. Libraries that have higher program attendance have higher circulation and more reference questions. 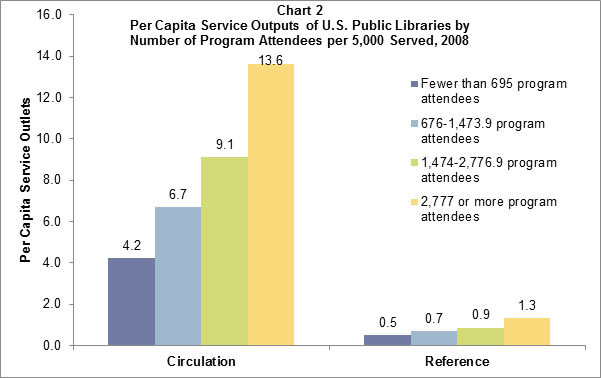 Note: Each bar represents a quartile of U.S. public libraries with program attendance per 5,000 people served. There are significant, positive correlations between the number of program attendees and both service outputs discussed. In other words, as library programming attendance increases, other services increase, and these relationships are meaningful. Circulation has a strong relationship with program attendance, with a correlation of 0.41.7 The correlation between program attendance and reference is lower, at 0.20, but this is still a significant relationship. More programs are being offered than ever in public libraries across the U.S. Attendance for these programs is steadily increasing and where program attendance is highest, use of other library services also increases. There are several possible reasons for the positive correlations between program attendance and use of other library services. Perhaps library programs are sparking an interest in attendees, causing them to seek out materials in the collection on the same topics or ask reference librarians for more information. Or, reference librarians may be promoting programs if their topics relate to the patrons’ reference questions. Regardless of the cause, it is important to note that libraries with higher program attendance also have higher circulation and more reference questions. At a time when unemployed academic librarians worry about the prospects of finding a job, many employed librarians face cuts in pay or hours and wonder how their salaries compare to those of other librarians in similar positions across the country. Using the 2010 American Library Association-Allied Professional Association (ALA-APA) Salary Survey8data, this Fast Facts compares the average academic librarian salaries in the West and Southwest region,9 which includes Colorado, to the salaries of academic librarians in all regions. These regional comparisons are broken down by type of academic institution and job category,10 so that a total of 18 comparisons are presented. The ALA-APA Salary Survey is a national survey conducted to ensure librarians, and those who hire librarians, have accurate and timely salary data. Information about the methodology, as well as additional data and findings, can be found in the 2010 ALA-APA Salary Survey. 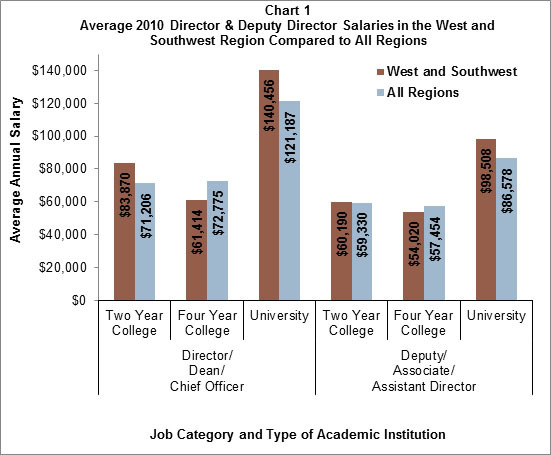 University library directors in the West and Southwest region are the highest paid academic librarians. They averaged a yearly salary of $140,456 in 2010 (see Chart 1). That figure is 16 percent more than the average reported for university directors in all regions, and 97 percent more than the national average salary of a director at a two-year college. Similarly, university deputy, associate, or assistant directors in this region were the highest paid librarians in their job category. Their average salary was 14 percent higher than those in all regions. 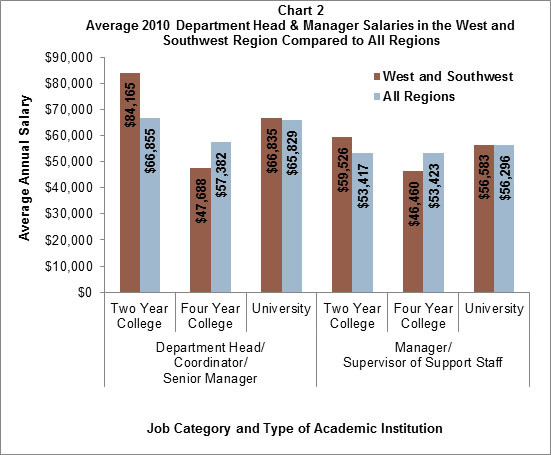 The West and Southwest region also has the highest average salary for department head/coordinator/senior manager positions; this position at a two-year college has an average salary that is 26 percent higher than the national average (see Chart 2). Yet that same position and region also has the lowest average salary at a four-year college, making 17 percent less per year, compared with all regions. The manager/supervisor of support staff category in the West and Southwest follows this trend, with those at two-year colleges making the highest average salary in this category, and those at four-year colleges making the lowest average salary. In fact, four-year colleges pay the lowest average salaries in every job category except beginning librarian. For the job category “librarians who do not supervise,” the highest average salary is for librarians in the West and Southwest region in two-year colleges (see Chart 3). Similarly, beginning librarians at two-year colleges in this region make the highest average salary of all academic institutions in this job category. 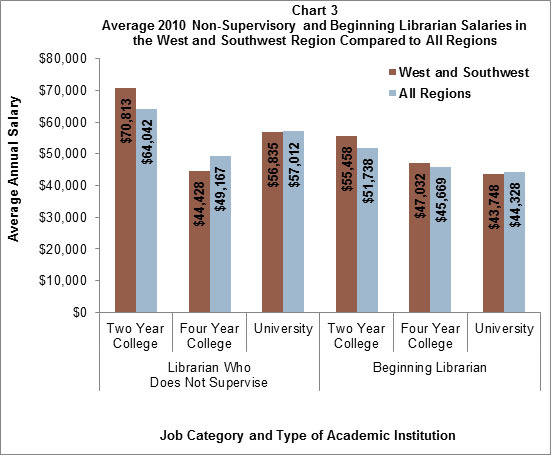 In 2010, the West and Southwest remained a competitive region for academic librarian salaries. Academic librarians in the West and Southwest received higher salaries than the national average in 11 of the 18 comparisons reported here. This was particularly the case in two-year colleges; academic librarians in the West and Southwest who worked in this type of institution reported the highest average salaries in each job category except director/assistant director. In spring 2010, the Library Research Service (LRS) repeated its observational study, first conducted in 2008, of U.S. Public Libraries and the Use of Web Technologies.11 The 689 libraries included in the study were selected as a random sample of public libraries across the country, broken down into 5 population groups and including all 114 public libraries in Colorado. LRS staff members visited the libraries’ websites—if they had one—to see what the libraries were doing with their web presences. The second round of the study led not only to comparisons between Colorado libraries and their counterparts across the country, but also to updates of what changed in the two years between studies. In general, Colorado results mirrored those of libraries nationwide. The percentage of libraries maintaining a website and offering patrons online access to their accounts showed minor increases over 2008 numbers, as the majority of libraries already provided these services. In 2010, at least 9 in 10 Colorado public libraries serving more than 10,000 people had websites and online patron account access – about the same as the percentages nationwide. The smallest Colorado libraries (those serving fewer than 10,000) are noticeably ahead of their peers nationwide in these two areas, with 8 in 10 maintaining a website and 6 in 10 offering online account access, compared to 7 in 10 and less than 5 in 10 (45%), respectively, nationwide. The ability for small Colorado libraries to maintain their own websites is undoubtedly supported by Plinkit, a turnkey website hosting solution managed and maintained centrally in Colorado by the State Library. Another collaborative effort that has allowed Colorado public libraries to surpass the national average is AskColorado, a statewide chat reference service mananaged by the State Library. 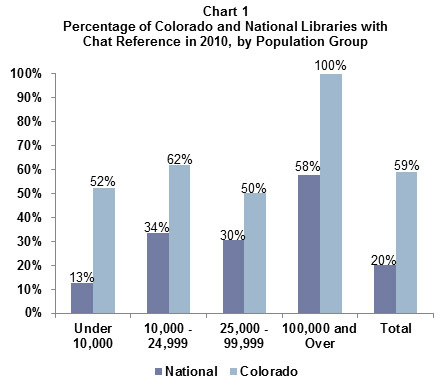 At least half of all Colorado public libraries, and all of those serving more than 100,000, provide chat reference – a much higher percentage than libraries nationwide (see Chart 1). At the time of the study only one Colorado library with chat reference did not use AskColorado. The service remains the most common form of online reference for Colorado libraries, more popular even than email. While some of the older, more basic web technologies such as blogs and email reference appear to have stagnated in rate of adoption, more interactive tools continue to grow in popularity. An excellent example is Facebook, and social media in general. In 2008, just 5 percent of Colorado public libraries were experimenting with any kind of social media, and those efforts were limited to MySpace and Flickr. None had ventured onto Facebook. 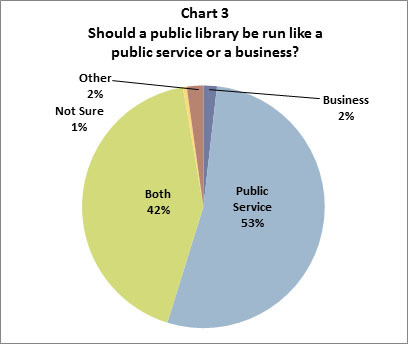 Two years later, 1 in 3 (34%) had an account, about the same percentage as libraries nationwide. That increased to 3 in 4 libraries serving more than 100,000 and 1 in 2 libraries serving 10,000-24,999 (see Chart 2). Flickr and Twitter are becoming more common as well, but MySpace—once the most popular social media site for libraries—is now the least used. Colorado libraries’ social media presence reflects that of libraries nationally, with Colorado libraries just edging ahead in use of Facebook, Flickr, Twitter, and YouTube. In addition to social networking sites, a growing number of Colorado libraries are making use of another tool that requires more user participation: RSS feeds. RSS feeds allow library users to sign up for regular announcements or updates of content from their libraries’ websites, including blog posts and new additions to the catalog. More than 1 in 3 (36%) Colorado public libraries use RSS feeds in some way, up from 13 percent in 2008. The greatest growth came in libraries serving 25,000-99,999, from less than 1 in 10 to 1 in 2. All but the largest Colorado libraries are considerably ahead of the national sample in offering RSS feeds. Disregarding size, at least half of all Colorado public libraries maintain websites that provide online access to patrons’ accounts, a search box, and chat reference services. About a third use RSS feeds or Facebook, but beyond that, implementation of various Web 2.0 technologies drops to just 1 in 4 libraries or less. National estimates follow a similar trajectory, but Colorado libraries maintain a higher percentage of use for all technologies except MySpace and SMS reference. The same is true when considering the percentage of patrons served by libraries using these tools. The majority of Colorado public library jurisdictions serve communities of fewer than 10,000 people and are less likely than larger libraries to experiment with Web 2.0 tools. As a result, some Web 2.0 technologies were relatively uncommon on library websites overall; nevertheless, they reached a much larger estimated percentage of patrons.12 All but 2 of the technologies included in the study (text reference and MySpace) reach at least 1 in 3 Colorado library patrons. For instance, just 1 in 3 libraries use Facebook, but 2 in 3 Coloradans are served by a library that has a presence on the social networking site (see Chart 3). When looking at the percentage of patrons served, chat reference again presents a noticeable gap between Colorado and the nation. Nearly 9 in 10 (88%) Colorado patrons have access to a library that offers the service – twice the estimated percentage of patrons nationwide (44%). By rating all libraries on an index of the number of web technologies adopted, LRS staff identified which were “Early Adopters” (i.e., the top 20 percent of each population group from the national sample). A growing number of Colorado libraries are performing better in regard to this measurement; nearly 1 in 10 (9%) scored half the possible points on the index, whereas in 2008 no libraries in the state reached that benchmark. When compared to non-early adopters, Early Adopters demonstrated higher inputs and outputs in areas traditionally measured to indicate library success, such as visits and circulation (see Chart 4). 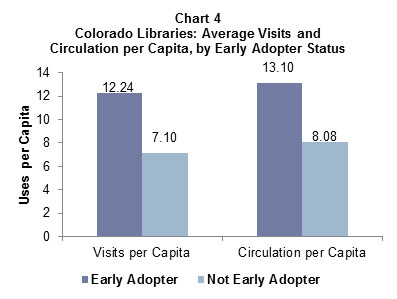 Additionally, Colorado Early Adopters reported having more librarians and staff and higher revenue. In fact, Early Adopters had higher numbers in all but one measure included in the study—print volumes per capita. Although not all of these differences were statistically significant, more were significant in 2010 than in 2008, supporting previous observations of a trend in tech-savvy libraries being more successful. Interestingly, Colorado libraries that were not Early Adopters reported more electronic users and computers per capita than Early Adopters nationwide, indicating that in some areas, all Colorado libraries are ahead of the curve. Since 2008, Colorado public libraries have shown minor increases in their adoption of basic web technologies, such as maintaining a web presence and offering online access to patrons’ accounts. Chat reference remains a popular feature of Colorado library websites, thanks to statewide service AskColorado, but likewise showed relatively small growth. At the same time, use of social media sites and RSS feeds has skyrocketed. While the Colorado results reflected those of the national sample, libraries in the state tended to be ahead of libraries across the country in most areas. 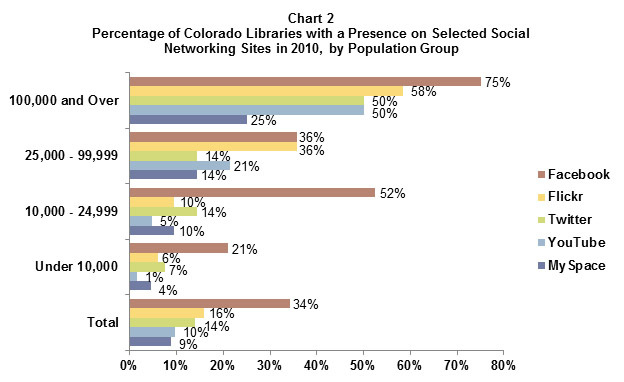 A higher percentage of Colorado libraries, compared to the national sample, use each of the technologies included in the study except MySpace and SMS reference. Furthermore, libraries that utilize these tools reach an even greater percentage of patrons than do libraries nationwide. Colorado Early Adopter libraries—those using more web technologies—reported higher numbers for all but one of the measures typically used to indicate library success. For more details, including results from the national sample, see the Closer Look Report U.S. Public Libraries and the Use of Web Technologies, 2010, on the LRS website http://www.lrs.org/public/webtech/. Over 500 registered employers use LibraryJobline.org to post open positions. The site is managed by the Library Research Service, a unit of the Colorado State Library, and most of the jobs posted (89% in 2010) are located in Colorado. Jobseekers can tailor searches to their own qualifications and preferences and receive customized emails when new jobs of interest are posted. 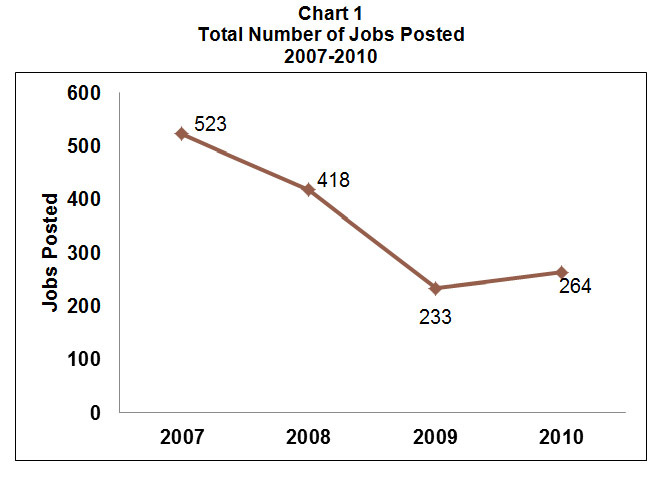 The database-driven site has also been gathering statistics on these job postings since 2007. This Fast Facts reports on these statistics for 2010 and outlines some of the trends in activity on the site over the past four years in an attempt to answer the ever-important questions jobseekers ask in these tough economic times: How many and what kind of jobs in our field are being posted, how much do they pay, and how many people are interested in them? It also highlights some disheartening trends that any astute jobseeker, within or outside of library work, has observed over the past 4 years: There is more competition than ever for fewer full-time, permanent positions, and salaries continue to stagnate. Total job postings rose 13 percent from 2009 to 2010, from 233 to 264, but they are still nowhere near pre-recession levels (Chart 1). 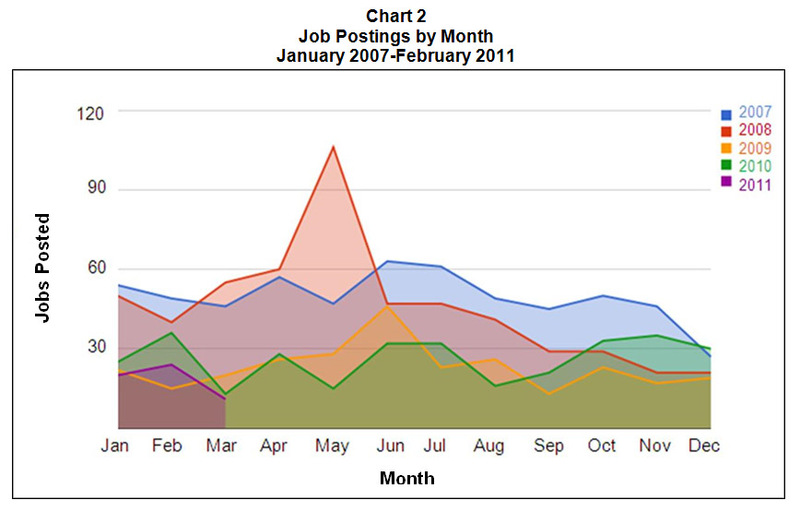 Chart 2 shows a more detailed, monthly view of Library Jobline posts for January 2007 through February 2011. May 2008 was Jobline’s busiest month, with 106 jobs posted. 2010 was rather unsteady from month to month, with anywhere from 13 (in March) to 36 (in February) jobs posted per month. April, June, and October tend to be good months for job posts regardless of the year. The number of individual views of all Library Jobline posts increased dramatically from 2009 to 2010, from 416,030 to 728,024 views (Chart 3). 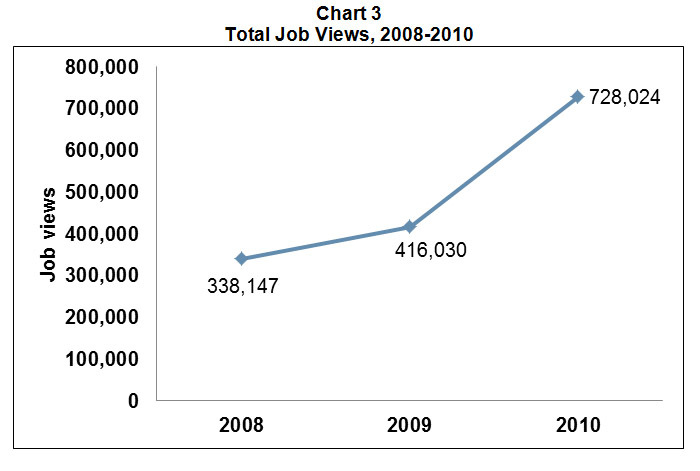 This means an average of 2,757 people viewed each job posted. In contrast, there were 1,786 views per job in 2009 and 809 views per job in 2008.13 So, accompanying the slight increase in jobs posted in 2010 is more interest than ever in those jobs. Of 2010’s Jobline postings, one-third (33%) required an MLIS, about one-tenth (11%) preferred it, and over half (56%) did not require it. For the first time since 2007, the average starting salary for a professional position requiring an MLIS dropped, decreasing from $24.50 per hour in 2009 to $24 per hour in 2010 ($49,920/year). 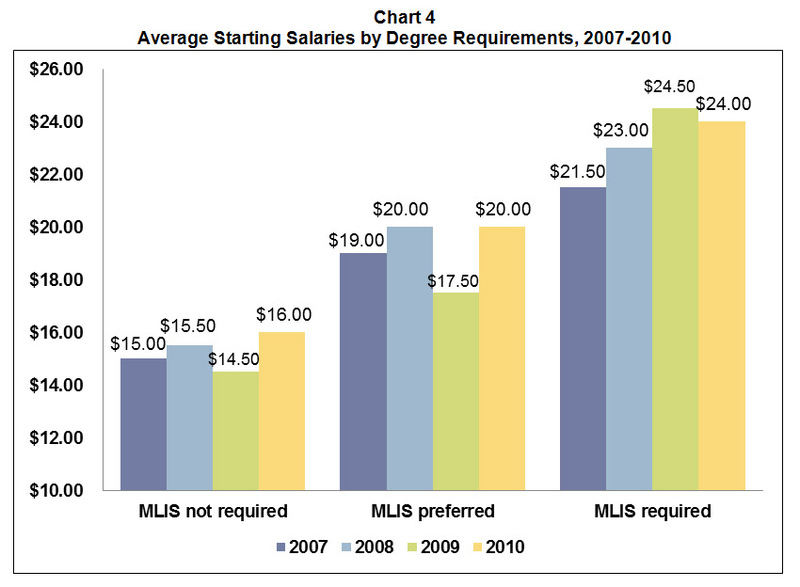 Salaries for jobs either preferring or not requiring an MLIS have both risen since 2009, averaging $20 per hour ($41,600/year), and $16 per hour ($33,280/year), respectively (see Chart 4). According to the national Occupational Employment Statistics from the Bureau of Labor Statistics (BLS), the average hourly wage for a professional Librarian position in May 2009 (the latest date for published statistics) was $26.76, placing Library Jobline’s 2009 and 2010 wages at the low end of the national spectrum. However, when comparing these figures, it is important to keep in mind that Jobline figures are starting salaries. The BLS national mean hourly wages for Library Assistants-Clerical and Library Technicians were $11.92 and $14.93, respectively, putting Library Jobline’s $16.00 per hour starting wage for a non-MLIS-required position on the high end of the national range. For Colorado specifically, the BLS reports higher average hourly wages than the national average: $29.58 for a Librarian and $15.22 for a Library Technician in 2009. Statistics from LibraryJobline.org reveal that the total number of Colorado library jobs available appears to be slowly creeping up from recession levels, but the number of full-time, permanent positions available continues to decline, reflecting a national trend over the past few years. Salaries for all types of jobs on the site have grown little over the past four years, and Colorado jobseekers also face more competition for local library jobs than ever before, based on the ratio of jobs posted to job views. Public libraries must make tough decisions about how to allocate limited funds to best meet their communities’ needs. These decisions take into account the responsibilities of maintaining a relevant collection, acquiring current technologies, and having the staff available to assist patrons and maintain technology. Examining the trends of key expenditure categories can give some insight into how libraries in Colorado adjust their spending over time to meet their communities’ needs. 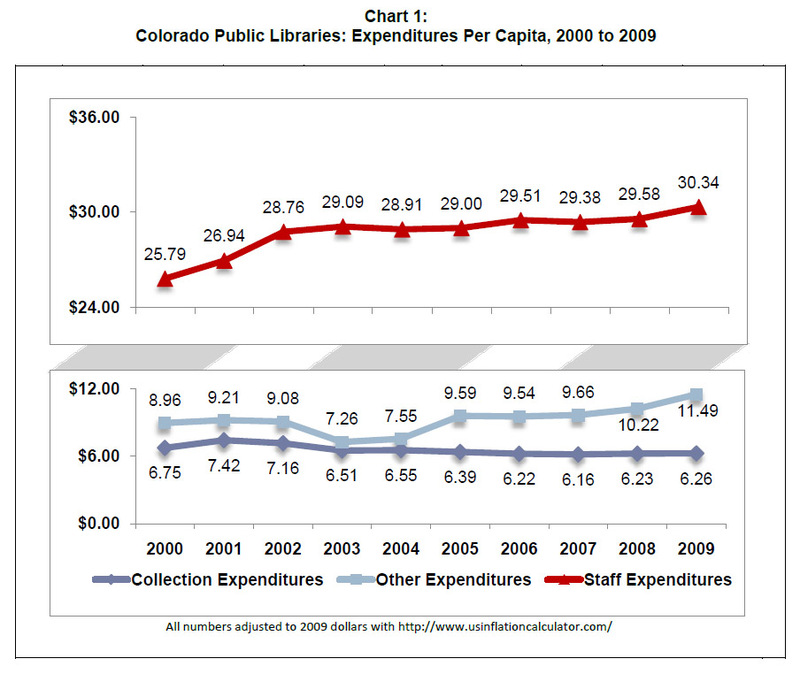 Library expenditures broken into three categories – collection, staff, and other operating expenditures (all adjusted for inflation)—show how public library funds have been allocated throughout Colorado as a whole between 2000 and 2009 (Chart 1). Collection expenditures per capita have gone down 49 cents over the past decade (-7%). Staffing remains the highest expenditure of public libraries; per capita staff expenditures have grown by 18% between 2000 and 2009. However, that increase is modest when compared to the 28% increase in “other operating expenditures per capita.” This category covers a wide variety of costs, including technology and the additional costs associated with independent library districts (e.g., building maintenance, human resources, and other expenses that may have been previously covered by city or county services). 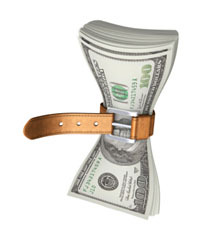 “Other Operating Expenditures” are all expenditures other than those reported for Total Staff Expenditures and Total Collection Expenditures and can include binding, supplies, consultants, furnishing expenses, and technology expenses such as computer hardware, software, support, and networks including the Internet. One factor that may be driving the increase in other operating expenditures is increased outlays for technology expenses. 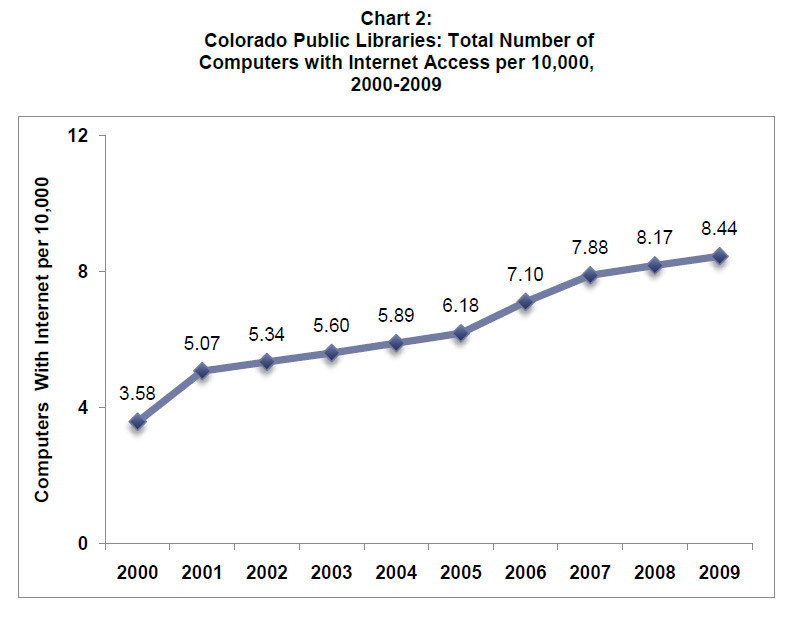 Between 2000 and 2009 the total number of public access computers per 10,000 served in Colorado public libraries more than doubled (Chart 2). Libraries have increased the number of computers to accommodate the evolving needs of patrons as content is transferred to and purchased in digital formats. As the number of computers increases, libraries incur additional expenses for software, peripheral hardware, and other technologies associated with computers. There were nearly 3 million more users of electronic resources at Colorado public libraries in 2009 than in 2001 (the first year this information was collected). While the increase in the number of public access computers may account for some of the increase in other operating expenses, more data is needed to paint a clearer picture of what is driving the increases in this category and how libraries are allocating resources to meet operation and community needs. 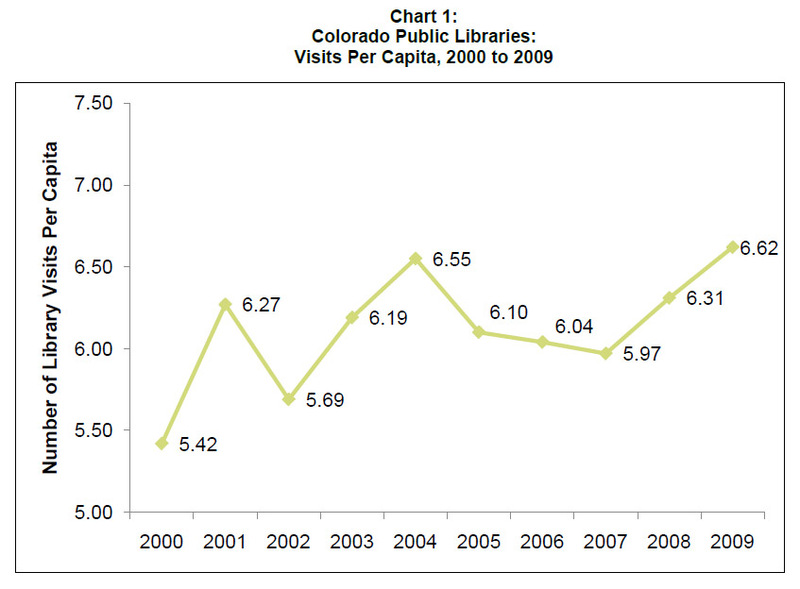 Colorado’s public libraries had another busy year in 2009. Library visits, circulation, and users of Internet computers reached record highs, and program attendance has risen considerably over the past decade. These four statistics are used to compute the Library Journal (LJ) Index of Public Library Service, a system that ranks the output measures of libraries nationwide so that their accomplishments may be recognized. Libraries with the top rankings within their expenditure group are honored as “Star Libraries.”16 This Fast Facts will assess how Colorado is doing on the data elements used in the LJ Index. 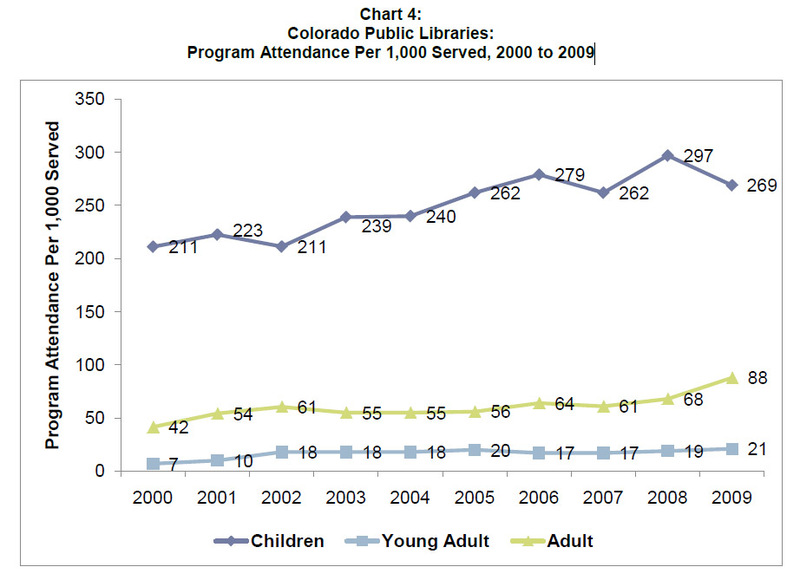 Colorado public library visits have risen from 22.6 million in 2000 to over 32.8 million in 2009. The sheer number of total visitors makes for busy libraries; the 6.62 visits per capita measure in 2009 tops the previous record of 6.55 visits per capita in 2004 (Chart 1). Overall, library visits per capita have increased by 22 percent over the past decade. Total materials circulation has increased steadily since 2000, peaking in 2009 with over 63.3 million materials circulated. Per capita circulation has grown by 36 percent from 2000 to 2009 (Chart 2). Children’s materials circulation per capita, which traditionally makes up around one-third of total circulation, has seen a 19 percent increase. Non-children’s materials circulation has been more integral to the overall increase, rising by 46 percent over the decade. Total circulation in 2009 was over 63 million. Children’s circulation alone reached 20 million. Not only are Coloradans visiting the library and checking out materials, they have also been attending the multitude of programs offered by their libraries. In 2008, the total number of programs offered reached 78,682, or 16.14 programs per 1,000 served, a record high for Colorado’s public libraries. 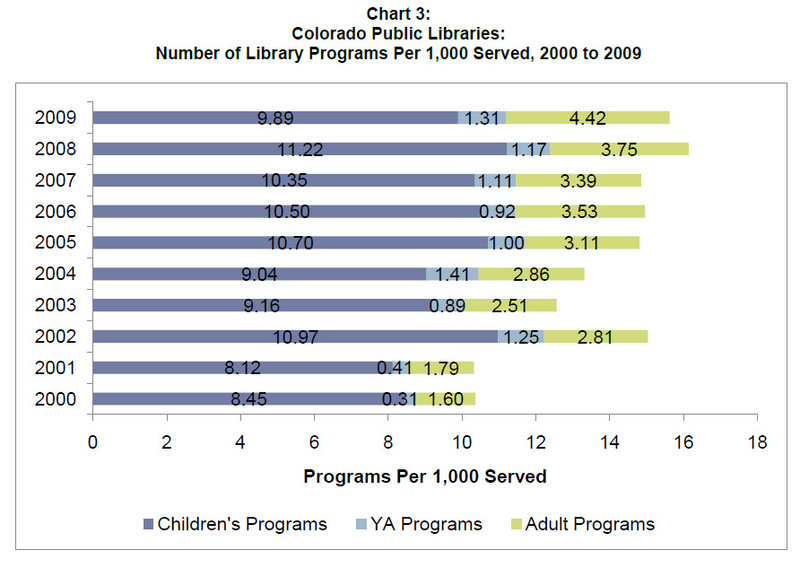 In 2008 Colorado’s public libraries offered a record number of programs to their patrons. The number of programs in 2009 was slightly lower (77,399, or 15.62 programs per 1,000 served). This decrease from the previous year can be attributed to a 12 percent drop in children’s programs, from 11.22 (2008) to 9.89 (2009) programs per 1,000 served (Chart 3). In contrast, the number of adult programs per 1,000 served increased by 18 percent in 2009, and young adult (YA) programs went up by 12 percent. The 2009 statistics reflect a change in the definition of YA programs to include attendees between 12 and 17 years of age; in prior years YA programs included attendees between 14 and 17 years of age. Therefore, increases in the numbers of YA programs and program attendees reported and decreases in the number of children’s programs and attendees reported are likely due, at least in part, to this definition change. From 2000 to 2009, there was considerable growth in the number of YA and adult programs per 1,000 served. The numbers of both of these types of programs approximately tripled during this time period. Children’s programs per 1,000 served increased by 17 percent from 2000 to 2009. The greater increase in the number of adult and YA programs over the past decade, as compared with children’s programs, has shifted the overall proportions of programs offered in Colorado libraries. In 2000, children’s programs accounted for 82 percent of the total number of programs. In 2009, the proportion of children’s programs decreased to account for 63 percent of the total number of programs. Children’s programs are still a driving force in library programming totals, but YA and adult programs are becoming increasingly common. Total attendance at Colorado library programs reached 1.87 million in 2009, an increase of more than 793,000 attendees since 2000. With the exception of dips in 2002, 2007, and 2009, total program attendance per 1,000 served has otherwise been on the rise over the past decade. YA program attendance per 1,000 served has tripled, adult attendance has more than doubled, and children’s attendance has increased by 27 percent (Chart 4). During the past decade, libraries have steadily increased their capacity to deliver online content through public access Internet computers, and since 200417 the number of users of Internet computers has risen for five consecutive years. 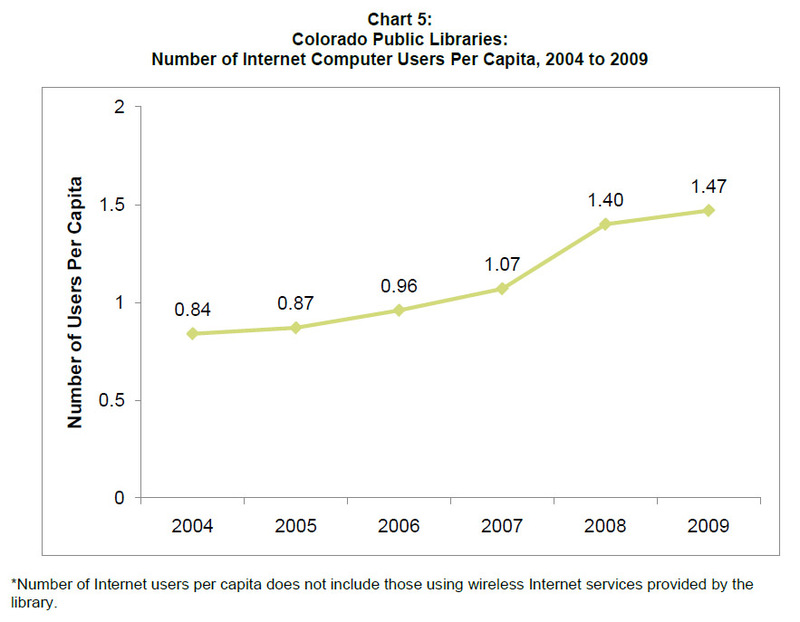 In 2009 there were 75 percent more Internet users per capita at Colorado libraries than there were in 2004 (Chart 5). Over half of that growth (58%) took place between 2007 and 2009. The recent surge in Internet users may also be due to the economic recession that began in December 2007. During periods of economic decline, people often cut back on discretionary spending such as home Internet access, and libraries may serve as an alternate point of access for them. Does Colorado Deserve a Star? 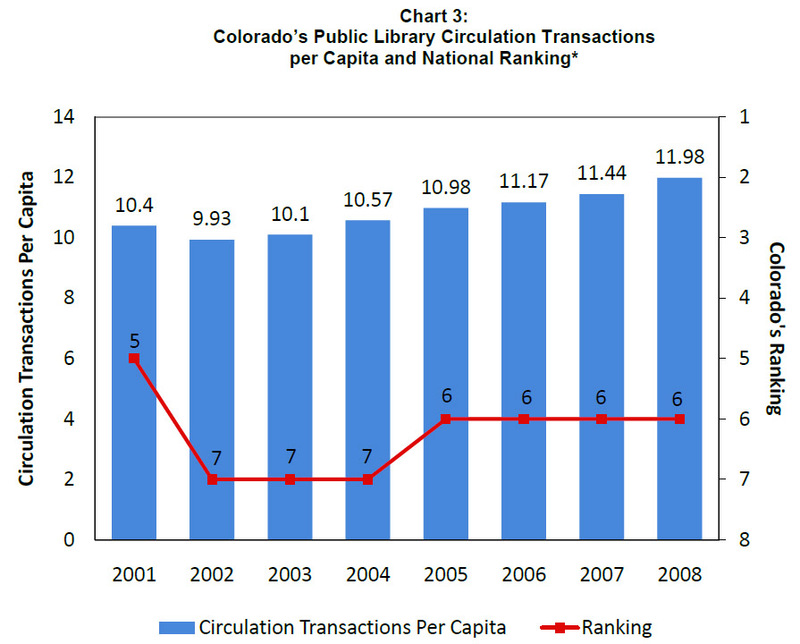 The LJ Index of Public Library Service for 2010 has announced that Colorado is currently home to eight Star Libraries (using 2008 data). Over the past decade there have been upward trends in each of the output measures used to calculate these ratings. During a time when there has been vocal opposition of government services and libraries by proponents of budget and tax cuts, it is important to note that demand for library services is high, and Colorado’s public libraries have been successful in delivering these valued services. In a November 2005 Fast Facts,18 the Library Research Service (LRS) posed the question, “One has to wonder: how long will Colorado remain one of the top 10 states for public libraries?” Each year, the Institute of Museum and Library Services (IMLS) calculates states’ public library summary data for a variety of outputs, and ranks every state according to its performance on each output. Colorado’s per capita measures generally have been on the rise since 2001, but does this mean their national rankings have followed suit? The statistics reported here provide insight about the performance of all Colorado public libraries—from the smallest to the largest—in relation to public libraries across the country. IMLS reports national and state library summary data for all 50 states and the District of Columbia. Findings are published on their website: www.IMLS.gov. * IMLS calculates statistics using imputed data for missing data, and an unduplicated population calculation that is distributed proportionally based on legal service area population. Therefore the IMLS per capita measures are slightly different than the same per capita ratios calculated by individual states. According to IMLS data, total library visits per capita have decreased by 1.4 percent between 2001 and 2008 for Colorado public libraries. This loss caused Colorado to fall out of the top ten in national rankings in 2006, only five years after claiming the number one spot (Chart 1). Even though Colorado’s total number of library visitors reached an all-time high in 2008 (30.7 million),19 the per capita measure rose only slightly and Colorado was ranked 13th in the nation. 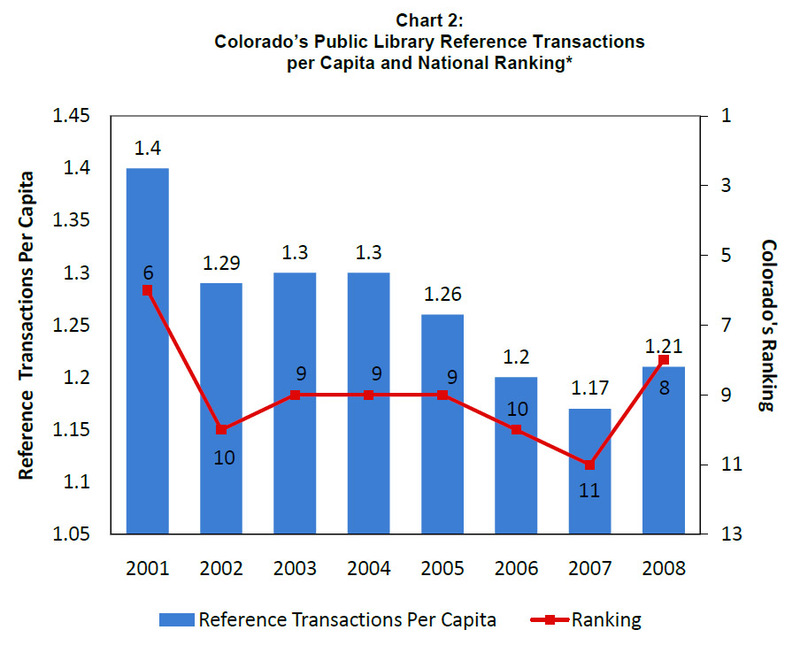 In 2001, Colorado ranked sixth in the nation for reference transactions per capita; however, the state fell in the rankings in subsequent years (Chart 2). After slipping to eleventh place in 2007, Colorado climbed back into the top ten (8th place) in 2008, while the per capita measure held fairly steady. Circulation statistics are a different story. 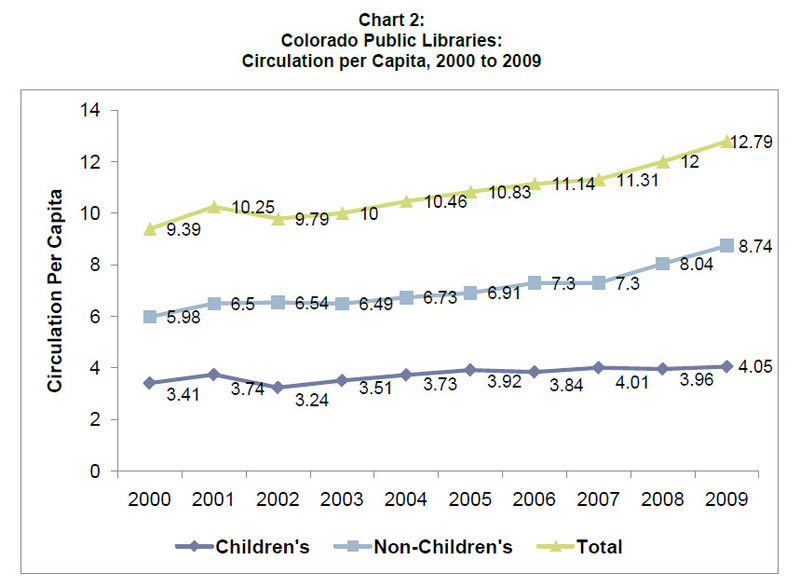 Colorado’s per capita circulation has remained in the top ten, holding steady in sixth place since 2005 (Chart 3). According to IMLS, total circulation has increased by 34 percent (from 43.5 million to 58.2 million) between 2001 and 2008. The fact that Colorado’s ranking remains fairly steady, yet per capita circulation has increased from 10.40 to 11.98, indicates that circulation has been on the rise in other states as well. In 2002, reporting began on the number of public access Internet computers in public libraries. 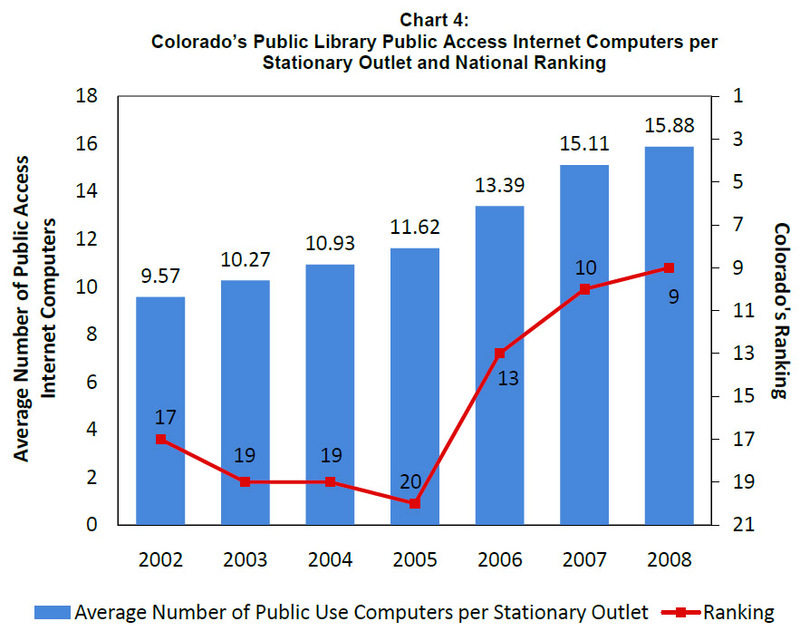 Since then, Colorado libraries have moved up in the national rankings for the average number of public access Internet computers per outlet (Chart 4). 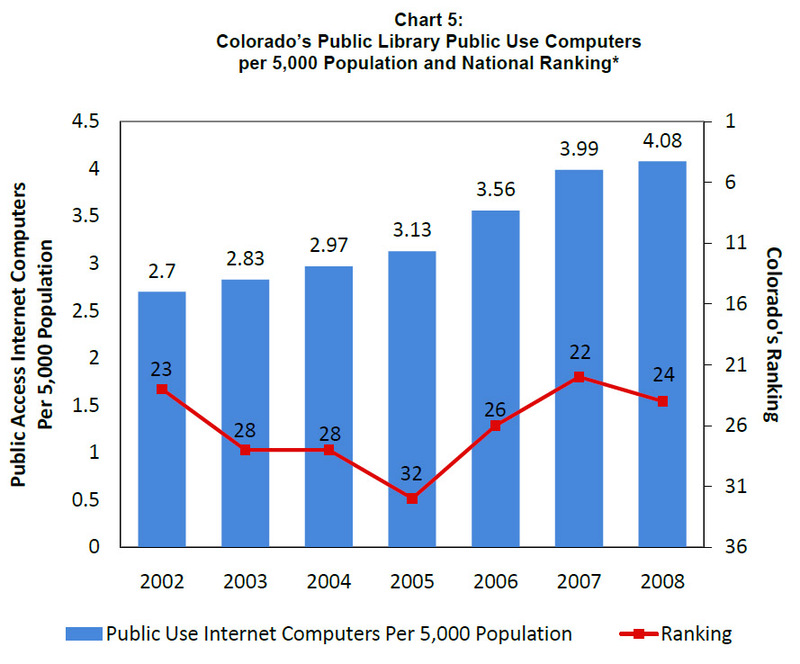 Colorado broke into the top ten for the first time in 2007 for the average number of public access Internet computers per outlet, and rose to ninth place in 2008. Although the number of computers per outlet is on the rise, the number of computers per 5,000 population in Colorado has remained in the middle of the national rankings, never rising above 22nd place across the time period reported (Chart 5). These lower rankings may be due at least in part to Colorado’s rapidly increasing population compared to number of computers. 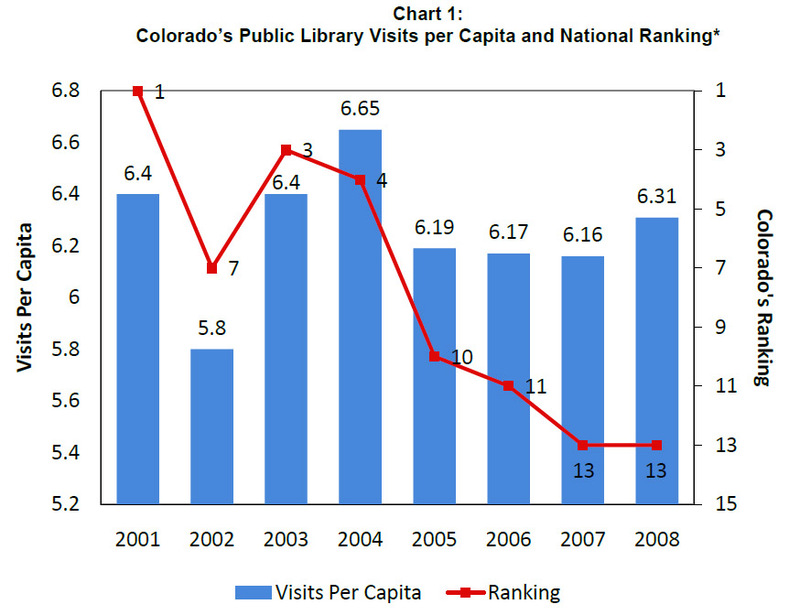 It is unclear what is to blame for the declines in Colorado’s national rankings in library visits and reference transactions per capita, as well as for its relatively low ranking for public access Internet computers per 5,000 served. Such factors as budget cuts, reduction in hours, and population growth all may be somewhat responsible. However, Colorado’s high circulation and number of computers per outlet rankings demonstrate that its public libraries are among some of the best in the country in providing residents with these sought after services.